On 16 February Acer will announce all the details about their entering into the mobile phone market. As they promised last year they will introduce at least one smartphone (most probably WinMo one). Perhaps you remember E-Ten Glofiish smartphones. Not long ago Acer bought the Taiwan-based mobile manufacturer E-Ten and promised to show the world their first Windows Mobile smartphone at the end of 2008 or early 2009. It seems it will happen at this year's Mobile Word Congress in Barcelona. 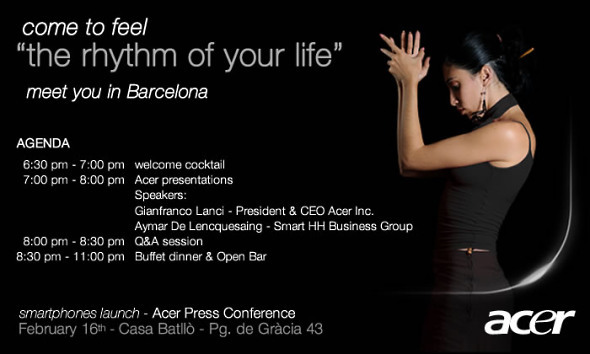 According to the official Acer invitation the smartphones launch will be on 16 February. As you may notice it says "smartphones", so there may be more than one handset to surprise us. There is no other information around, but some people guess that the upcoming devices may be powered by the latest Windows Mobile 6.5. You can count on us being there and covering the event for you.